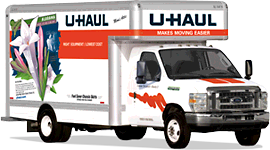 Not only are we the most trusted self storage center in Missoula, but we are an authorized neighborhood U-Haul dealer. Choose from the available truck sizes we keep for in town and one way use. Our staff will be happy to help you pick the right truck to get the job done. Our self storage facility specifically designed for the navigation of large trucks, to make sure you can pull right up to the door of your storage unit. We have been a trusted U-Haul neighborhood dealer since 2001, and will continue to serve as Missoula's friendliest self storage and u-haul affiliate. 15' Thrifty Mover Volume: 669 cu. ft. Max Load: 3,100 lbs. Inside Dimensions: 11'4" x 7'5" x 6'9" (LxWxH) Low Deck makes it 50% easier to load.